Still manufactured according to the original formulas developed by company founder and noted Italian painter Gianni Maimeri in 1922, Artisti Oils are premium-quality artists' oils that represent the best of both tradition and innovation. "Just oil and pigment — no additives, no wax, and search out the best pigments from all over the world." This was Maimeri's directive when formulating these paints. The result is an oil colour with remarkable purity, intensity, brilliance, and colouring power. The Artisti line offers a vast palette of colours, including a number of authentic historical pigments — Zinc White, Prussian Blue, Manganese Violet, Bitumen, and true Sienna earths. 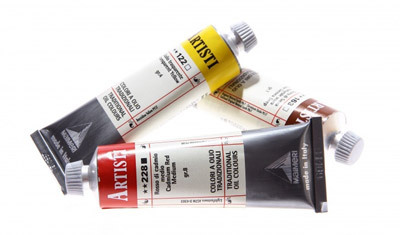 Each colour is ground according to the characteristics of the individual pigment to achieve optimal levels of viscosity and dispersion, making Artisti Oils an excellent choice for all styles of painting, from glazing to impasto. With the exception of the whites, which are ground in safflower oil, all Artisti Oils are prepared in the classical way using top-quality, cold press linseed oil, assuring your best creations will stand the test of time. Less lightfast pigments, and especially those which are hazardous to the health, have been replaced with modern alternatives that resemble the characteristics of the original colours without the associated health concerns. The few colours still considered to some degree damaging to the health (obviously to be used with due precaution) are always marked with a warning symbol.